At our September Town Hall the council had our first reading for the Cheverly Climate Change Resolution(link). In order for a resolution or ordinance to pass it goes through three readings and a vote. So as it stands the vote for this ordinance will be at the November Town Meeting on November 9th at 8pm. Feel free to come to either town hall to participate in Citizen Input to let your council know what you think about this. Another issue that we are currently working on is the Cheverly Non-Intervention Ordinance. This ordinance would clarify the unwritten practice of the Cheverly Police Department that they are not to participate in civil immigration law. The council will be discussing this again at the October 26th Work Session so if you are interested and able, please come to listen and share your perspectives on this issue. The Cheverly Day Committee needs You! Are you excited about the town and ready to build something exciting? If so think about joining the Cheverly Day Committee to help make one of the most memorable days in the year! One of our amazing neighbors is looking to set up a Cheverly Makerspace for kids up to high school. This program would provide a space for youth in Cheverly who often go to different schools an opportunity to hang out with each other after school and to work on their STEM skills. Please email me if you'd like to get involved in the development! The Cheverly Police Department hosted their annual public safety day. Fun times were had by all! 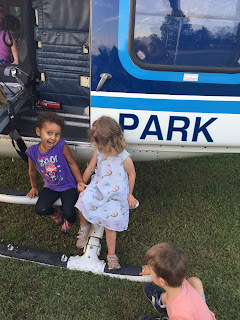 The highlight was definitely the huge helicopter that the kids could walk around in, one of my kids friend got so excited that she buckled herself in! Thank you Cheverly PD for such a great night! Another great event this month was the Cheverly Community Market's Sip Local Event. It was a great evening with samples from two breweries, one winery and two distilleries! The organizer from the Craftsman building (CrEATive Fixings) was there too to discuss her vision for the property. There was even live music! I am really looking forward to the next event! Cheverly Parent Resource Center is sending out weekly updates (link) on events in and around Cheverly, please sign up if you'd like! Landover Row (across from Walgreens)is getting a facelift. Additionally, they are planning to put in a coffee shop out front!